As we've been cleaning out warehouse space during the Shoppe expansion, I'm uncovering the coolest junk and repurposing it into other things. 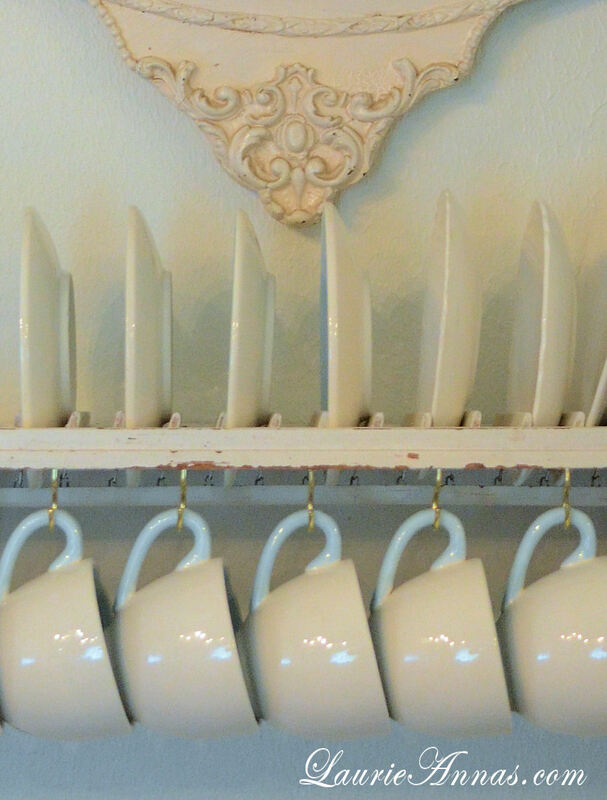 Old bi fold shutter panels, rusty shelf brackets, and a dozen cup hooks were all it took to create this cool plate rack. This shutter is small, measuring 9" wide x 32" long, and was actually part of a bi fold which I separated so I could make two shelves. These brackets and shutters were meant to be together because the brackets fit so snugly between the slats of the shutter, that it almost didn't need screws, but we added them for safety. Next, I sprayed it with a coat of clear matte sealer. After that, we measured and added a dozen cup hooks to the front underside of the shelf. 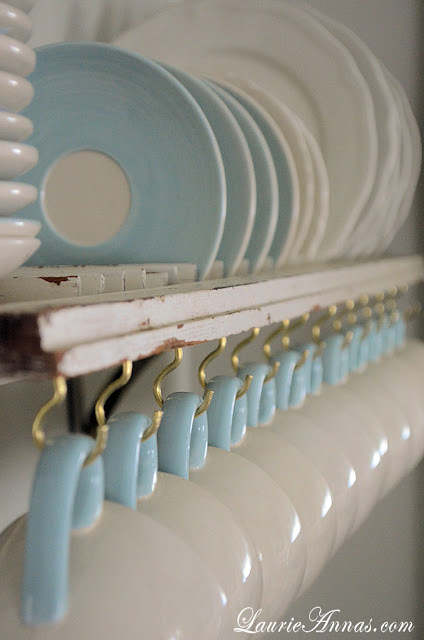 Once we attached it to the wall, plates of all sizes slipped right between the slats and stood up perfectly. I love how it looks in the dining room! The entire project took about 15 minutes and most of that was spent spacing out the hooks. Crazy easy, crazy quick, and crazy fun! How's that for a repurposing project? Easy peasy is the name of the game today! Love this idea, so beautiful and such a great use of an old shutter. You are amazing! So cute! 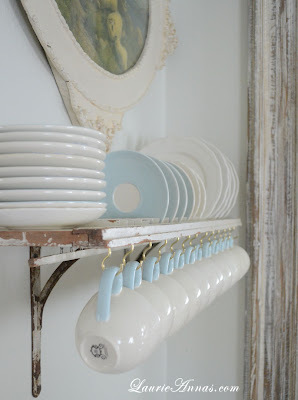 Love the pretty saucers and cups too! how well it works as a plate display. I need to find a spot in my house for this and I'm pinning it. Love it, LaurieAnna. Cool thing is that I have a small gray shutter almost identical to yours. Great idea. Hope you are doing well. I know you are super busy. I think about you often. L'idée est non seulement excellente mais l'effet et son utilité formidable. Whoa...shut the shutters! !...Genious...what a fantastic idea!...The shelf is just beautiful and love the chippy! this is so cool..I have been telling people about using the shutters I find for shelves ...and this is a great example...I have a really old set of chippy green.the only ones not to sell as of yet. I have sold around 8 to date..but not these..time to break down and just make a set of shelves out of them...and they will problably will sell...then,,,Did you seal the chippy so not getting on eating dishes? 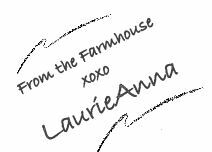 LOVED this, LaurieAnna! Had to pin it!! :) You are a genius! Isn't this a darling idea! I need to pin this also. Hope all is going well and can't wait to see the new expansion. Blessings sweet lady! This did yurn out cute, you're so clever LA! Okay, you must come by on Monday and share this at Nifty Thrifty Tuesday...it's just sooooo "cool"!!! LOVE this idea!! And, it is so darn cute! Saw your post on FB and had to see it "up close". Just love it! How did you get the shutters to stay open that way? Was that done with the brackets? Crazy great idea! LOVE IT! Thank you... I was needing some 'original' ideas for plates and cups... they are taking us over at my house! I needed an idea-AWESOME and wish I had thought of it! love your ideas always! 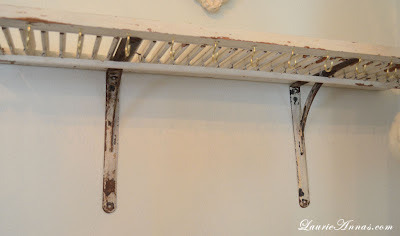 I have TONS of shutters to go thru and just retrieved the neatest length of old wood w old hooks on it... I can see it coming together!!! Keep up the great work and thanks for sharing!!! 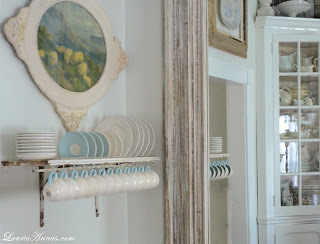 I just cut some up for a closet door header and have used them as doors on children's cabinets---but I never thought of a plate rack! Well, good grief...I was meant to read your blog today because I just bought 11 shutters, thinking they would fit some of my windows and, booo hooo, they are about 7 inches too short. What to do with that many shutters..??.. well, now I know I can make a few plate racks. AWESOME...thanks, girl, for this great idea. May I use a photo of yours so that when I make mine, I can show where I got the inspiration from? What a great idea!! It looks fabulous. I love your dishes too. YOU MY DEAR ARE AMAZING!!! ENOUGH SAID!!! Fabulous! 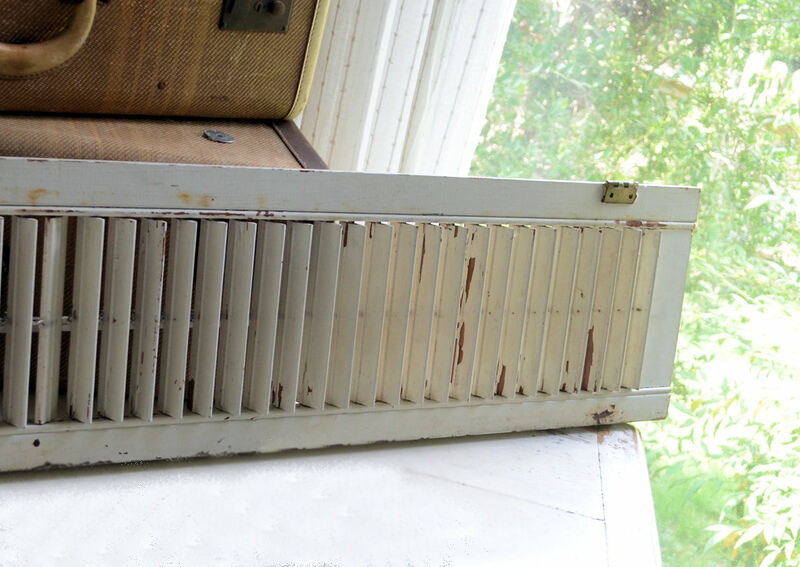 I just passed up some great shutters at a farmhouse sale, drats! Love what you did. What a fabulous idea - looks great! Love those dishes, too. I'm your newest follower-LOVE your blog and your style! Love LOVE your blog! You have a new follower! love love love this!! awesome creative idea!! I love the blue and white! That is just crazy cool how perfect that is! What a fabulous Idea and execution!!! Love the shutter/plate rack. soooo adorable! This is the coolest idea ever! It stopped me dead in my tracks, I just love it! Had to let you know. Great idea - not too sure about the distressed look though. I'd have given it a coat of fresh gloss. I had a ton of shutters, this is a genius idea! This DIY project is very creative and of course, resourceful. I am also fond of doing some DIY projects myself. I've made some cabinets using some old exterior wood shutters but this one is more brilliant. Any chance you know where to find those dishes?! they are lovely! 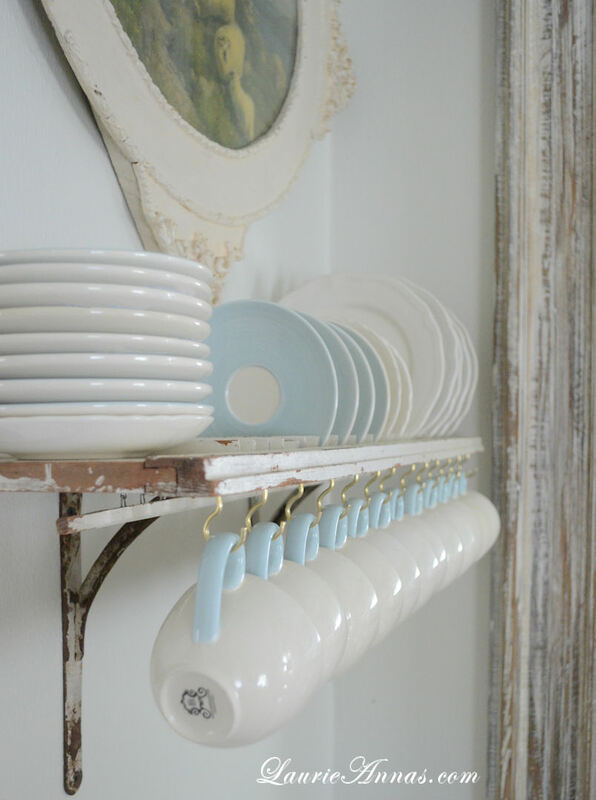 Any chance you know where I might find the dishes from this post? They are just lovely!